INPEFA® is an acronym of INtegrated Prediction Error Filter Analysis. This analysis method is applied to facies sensitive well logs. The resulting INPEFA® curves show discontinuities in the log data, which in terms of geology can be interpreted as hiatuses, erosional surfaces, and changes in lithology and/or sedimentation rate. Since these geological phenomena may occur on a field or even regional scale, INPEFA® curves are extremely helpful in well correlations. Here we explain how INPEFA works and how INPEFA curves can be used for high-resolution and -quality well correlation. A well log consists of a series of measurements of a certain property, normally taken at regularly spaced depth intervals along a wellbore. Because of this regular spacing, the log can be treated as a (depth-) time-series from a mathematical point of view. Linear prediction methods can be applied to (depth-) time-series of any well log. 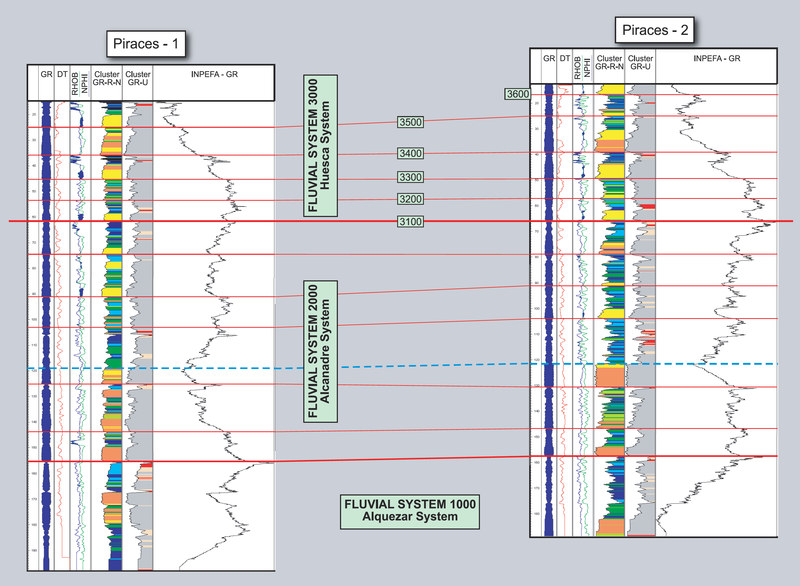 The figure below illustrates how we apply linear prediction to well data. The length of a sliding window is defined. This length determines the amount (‘n’) of log measurements (‘X’, grey squares) that are included in the calculations. The amount of linear filter coefficients (‘C’, orange squares) also equals ‘n’. All or a part of a well log may be selected to be used in the PEFA calculation. The value of the linear prediction filter coefficients (C) are optimized to yield the smallest error (see next steps 3-5) within the selected depth interval. Each log measurement is weighted by multiplying its value with a corresponding linear prediction filter coefficient. This contribution is labeled ‘Y’. All contributions (‘Y’) to the prediction are summed to yield the ‘Predicted Value’. 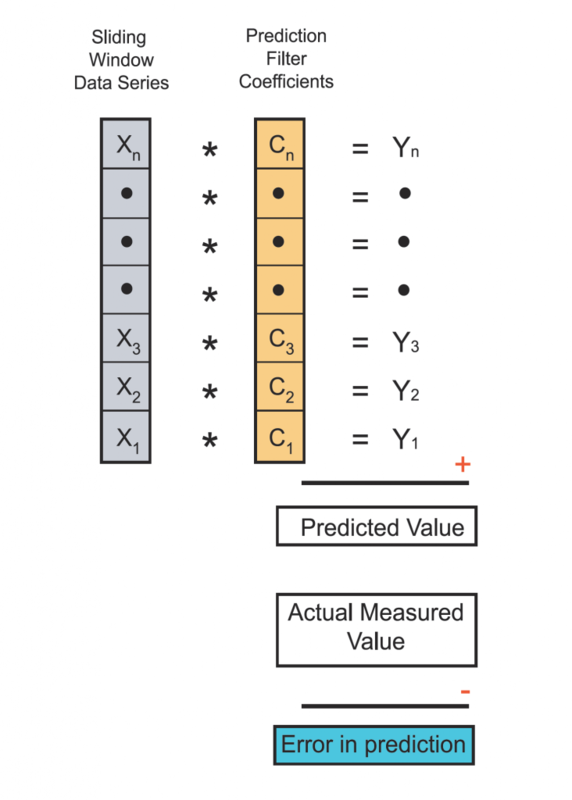 The ‘Error in prediction’ is calculated: it is the difference between the ‘Predicted Value’ and the ‘Actual Measured Value’ (i.e. the next log measurement). The ‘Error in prediction’ reflects the discontinuity in the data. This calculation is repeated each time the window slides upwards to the next measured log value, and terminates once the window reaches the end of the selected depth interval, as defined in step 2. A PEFA curve displays discontinuities in well log data (‘Errors in prediction’, see above). These discontinuities are important for making well correlations. Consider the highly simplified synthetic logs in the figure below. Each log contains a different type of discontinuity in the data: a missing section, an amplitude change or a frequency change. 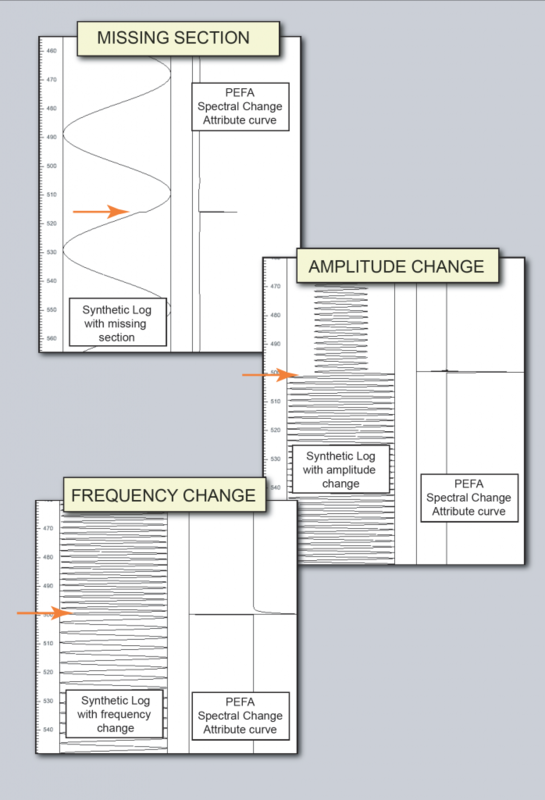 The PEFA curves associated with each of these synthetic logs clearly indicate where there is a discontinuity (‘Error in prediction’) in the data (orange arrow in the figure). Since these geological events occur on a field or even regional scale, they are very useful for establishing well correlations. By numerically integrating and normalizing the PEFA curve, an another valuable curve is generated called the INPEFA® curve. This curve shows trends and turning points that are not apparent in the original well log data. An INPEFA® curve displays trends that can be explained in terms of the calculated prediction errors (see above). A negative trend in the INPEFA® curve is a trend to the left when going upwards along the curve (see figure above). This trend marks an interval in which errors in prediction (as displayed in the PEFA curve) are predominantly negative, meaning that the prediction filter has consistently underestimated the measured log value. A positive trend in the INPEFA® curve is a trend to the right when going upwards along the curve. This trend marks an interval in which errors in prediction are predominantly positive, meaning that the prediction filter has consistently overestimated the measured log value. Turning points in the INPEFA® curve show the transitions from a positive to a negative trend (‘negative turning point’) or from a negative to a positive trend (‘positive turning point’). A hierarchical approach is applied to identify trends and turning points of different order in each INPEFA® curve. 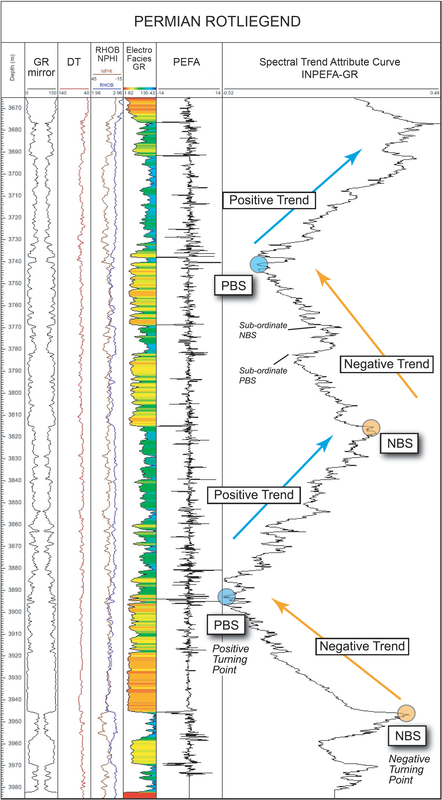 Subsequently, the identified trends and turning points are used to correlate multiple well logs. In this way, high-resolution well log correlations can be generated, as illustrated in the figure below.